Links have always been part of Google’s ranking algorithm. In fact, in its earliest onset, links were one of the only ranking factors. This created a culture of manipulation in which websites would compete in an arms race for links. The quality of the link did not matter at that time. You could spam links on the comment sections of blogs and earn credit in the form of link equity. Soon black-hat SEO’s started developing blog networks and link wheels to keep equity distributed to all of their business associates. Google’s algorithm has since evolved and it can detect link spam rather easily. Despite this, earning quality links remains part of an ideal SEO strategy. Why Do Links Matter for Roofing Websites? With all other things being equal, websites with higher quality links will outrank those without them. Google can detect the backlink profile of a given website and uses it to determine how trustworthy the site is. Links from well established 3rd parties with a solid reputation of their own will transfer link equity to your roofing site. Conversely, spam sources will be either ignored entirely or used to penalize your pages from ranking on Google. While the latter is unlikely, blatant manipulation of the link building process is still subject to manual penalty. The links that hold the most weight from an SEO perspective are known as ‘follow’ or ‘dofollow’ links. These kinds of links are identified by the absence of a ‘nofollow tag’, which you will learn more about in just a moment. Follow links prompt Google crawlers to consider them as endorsements of sort the page in which they lead to. When a well-known external website links to you naturally, it is almost always a followed link and therefore very helpful for SEO. Link building is a critical component to search engine optimization (SEO). Google uses links to determine the authority, credibility, and establishment of web pages. Using crawling technology, bots navigate websites for links so that they can be properly indexed on search results. Since the inception of Google as the world’s most prominent search engine, inbound links, both in quantity and quality, have been a strong indicator of page quality. While certain manipulative tactics have been disallowed, link building still plays a strong role in where a web page ranks on SERPs. The end result of quality link associations is positive, but roofing companies mustn’t lose sight of their foundation. To develop valuable inbound links, you must create content worth associating with. Content creation is the pillar of every link building strategy. As Google’s algorithm has gotten more sophisticated, link development is less about “building” and more about “earning”. While links can still be manually established via business directories, social media profiles, and other platforms, inbound links that are earned organically hold the greatest value, and serve as a “vote of confidence” to your website. Though inbound links have the greatest impact on rank position, there are other associations that constitute link building. In addition to backlinks, there are external and internal links. External links are channels from your website to an external source. This would take place when you wanted to show a vote of confidence for a 3rd party web page, perhaps a roofing material supplier that you have a business relationship with. Internal links are channels that exist within the confines of your website. Your residential roofing web page might have an internal link that leads to a shingle roof installation page, aiding the navigation of your users. Backlinks, also known as inbound links, are the single most important type of link for search engine optimization. They serve as votes of confidence from one web entity to another. As Google’s algorithm has evolved, the search engine has cracked down on manipulative backlink development, which creates a false sense of authority. In 2019, to develop quality backlinks, you really have to “earn” it. Earning backlinks happens with the creation of quality web pages, blog posts, and other forms of content. Offline marketing and branding also play a role in online link building. If your company is known in the local community, it makes sense that the notoriety would translate to the digital landscape. One important aspect of backlinks to consider is anchor text. When you hear the term anchor text, it refers to the linked text on a web page. 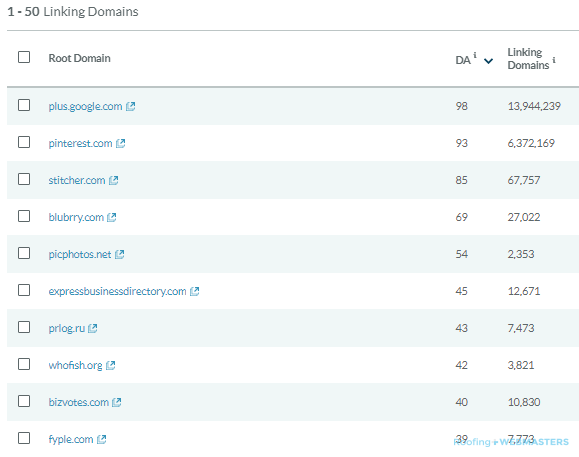 As you can see from this post, the words backlink monitoring are linked to a page of the same name. While in this case, it is an internal link that leads you to a new page on the same website, it helps you understand the concept of anchor text. Another factor to consider for inbound links is reciprocation. The most valuable backlinks are not reciprocated, meaning there is no “help me, and I help you” agreements or understandings. Google prefers organic link building that happens on the merit of a page’s content, and its relevance to the corresponding anchor text. Updated on March 14, 2019 at 4:07 pm by Roofing Webmasters.